Tin is one of the basic chemical elements. When refined, it is a silvery-white metal known for its resistance to corrosion and its ability to coat other metals. It is most commonly used as a plating on the steel sheets used to form cans for food containers. Tin is also combined with copper to form bronze and with lead to form solder. A tin compound, stannous fluoride, is often added to toothpaste as a source of fluoride to prevent tooth decay. The earliest use of tin dates to about 3500 B.C. in what is now Turkey, where it was first mined and processed. Ancient metalworkers learned to combine relatively soft copper with tin to form a much harder bronze, which could be made into tools and weapons that were more durable and stayed sharp longer. This discovery started what is known as the Bronze Age, which lasted about 2,000 years. The superiority of bronze tools spurred the search for other sources of tin. When extensive tin deposits were found in England, traders brought the precious metal to countries in the Mediterranean area, but kept the source a secret. It wasn't until 310 B.C. that the Greek explorer Pytheas discovered the location of the mines near what is now Cornwall, England. Much of the impetus for the Roman invasion of Britain in 43 A.D. was to control the tin trade. The chemical symbol for tin, Sn, is derived from the Latin name for the material, stannum. Elsewhere in the world, tin was used in ancient China and among an unknown tribe in what is now South Africa. By about 2500-2000 B.C. , metalworkers on the Khorat Plateau of northeast Thailand used local sources of tin and copper to produce bronze, and by about 1600 B.C. bronze plows were being used in what is now Vietnam. Tin was also known and used in Mexico and Peru before the Spanish conquest in the 1500s. The use of tin as a plating material dates to the time of the Roman Empire, when copper vessels were coated with tin to keep them bright looking. Tinned iron vessels appeared in central Europe, in the 1300s. Thin sheets of iron coated with tin, called tinplate, became available in England during the mid-1600s and were used to make metal containers. In 1810, Pierre Durand of France patented a method of preserving food in sealed tinplate cans. Although it took many years of experimenting to perfect this new technique, tin cans began replacing bottles for food packaging by the mid-1800s. In 1839, Isaac Babbitt of the United States invented an antifriction alloy, called Babbitt metal, which consisted of tin, antimony, and copper. It was widely used in bearings and greatly assisted the development of high-speed machinery and transportation. In 1952, the firm of Pilkington in England revolutionized the glassmaking industry with the introduction of the "float glass" method for the continuous production of sheet glass. In this method, the molten glass floats on a bath of liquid, molten tin as it cools. This produces a very flat glass surface without the rolling, grinding, and polishing operations that were required prior to the introduction of this method. Today, most of the world's tin is produced in Malaysia, Bolivia, Indonesia, Thailand, Australia, Nigeria, and England. There are no major tin deposits in the United States. There are nine tin-bearing ores found naturally in the earth's crust, but the only one that is mined to any extent is cassiterite. In addition to the ores themselves, several other materials are often used to process and refine tin. These include limestone, silica, and salt. Carbon, in the form of coal or fuel oil, is also used. The presence of high concentrations of certain chemicals in the ore may require the use of other materials. The process of extracting tin from tin ore varies according to the source of the ore deposit and the amount of impurities found in the ore. The tin deposits in Bolivia and England are located deep underground and require the use of tunnels to reach the ore. The ore in these deposits may contain about 0.8-1.0% tin by weight. Tin deposits in Malaysia, Indonesia, and Thailand are located in the gravel along streambeds and require the use of dredges or pumps to reach the ore. The ore in these deposits may contain as little as 0.015% tin by weight. Over 80% of the world's tin is found in these low-grade gravel deposits. 1 When the gravel deposits are located at or below the water level in the stream, they are brought up by a floating dredge, operating in an artificial pond created along the streambed. The dredge excavates the gravel using a long boom fitted either with chain-driven buckets or with a submersed rotating cutter head and suction pipe. The gravel passes through a series of revolving screens and shaker tables onboard the dredge to separate the soil, sand, and stones from the tin ore. The remaining ore is then collected and transferred ashore for further processing. 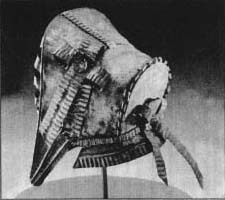 A tin bonnet was ofien given as a tenth anniversary gift during the 1800s. However, it was also popularly used to produce a gift for the tenth anniversary, called the "tin anniversary." While not as well-known as the twenty-fifth, which requires silver gifts, the Victorian housewife knew she might well receive a tenth anniversary gift of tin like the tin bonnet depicted here. Shaped in the form of a "spoon bonnet" popular about 1870, it is likely that this piece dates to that time. Certainly, it can't be worn, but was meant to be displayed on a shelf as a remembrance of that anniversary. Tinsmiths provided whimsical gifts just for this purpose. Museum collections include not only hats but tin shoes and decorative vases that could never be used to hold water. When gravel deposits are located at or below the water level, they are brought up by a floating dredge, operating in an artificial pond created along the streambed. When the gravel deposits are located in dry areas at or above the water level, they are first broken up with jets of water pumped through large nozzles. Next, the ore enters the cleaning or dressing shed adjacent to the mining operation. stream, they are first broken up with jets of water pumped through large nozzles. The resulting muddy slurry is trapped in an artificial pond. A pump located at the lowest point in the pond pumps the slurry up into a wooden trough, called a palong, which has a gentle downward slope along its length. The tin ore, which is heavier than the sand and soil in the mud, tends to sink and is trapped behind a series of wooden slats, called riffles. Periodically the trapped ore is dumped from the palong and is collected for further processing. 2 The ore enters the cleaning or dressing shed adjacent to the mining operation. First, it passes through several vibrating screens to separate out coarser foreign materials. It may then pass through a classifying tank filled with water, where the ore sinks to the bottom while the very small silt particles are carried away. It may also pass through a floatation tank, where certain chemicals are added to make the tin particles rise to the surface and overflow into troughs. 3 Finally the ore is dried, screened again, and passed through a magnetic separator to remove any iron particles. The resulting tin concentrate is now about 70-77% tin by weight and consists of almost pure cassiterite. 4 The tin concentrate is placed in a furnace along with carbon in the form of either coal or fuel oil. If a tin concentrate with excess impurities is used, limestone and sand may also be added to react with the impurities. As the materials are heated to about 2550° F (1400° C), the carbon reacts with the carbon dioxide in the furnace atmosphere to form carbon monoxide. In turn the carbon monoxide reacts with the cassiterite in the tin concentrate to form crude tin and carbon dioxide. If limestone and sand are used, they react with any silica or iron present in the concentrate to form a slag. 5 Because tin readily forms compounds with many materials, it often reacts with the slag. As a result, the slag from the first furnace contains an appreciable amount of tin and must be processed further before it is discarded. The slag is heated in a second furnace along with additional carbon, scrap iron, and limestone. As before, crude tin is formed and recovered along with a certain amount of residual slag. The tin concentrate is placed in a furnace along with carbon in the form of either coal or fuel oil. It is heated and forms a slag along with the crude tin. The slag and crude tin are heated several more times to remove impurities and recover tin hardhead. 6 The residual slag from the second furnace is heated one more time to recover any tin that has formed compounds with iron. This material is known as the hard head. The remaining slag is discarded. 7 The crude tin from the first furnace is placed in a low-temperature furnace along with the crude tin recovered from the slag plus the hard head. Because tin has a melting temperature much lower than most metals, it is possible to carefully raise the temperature of the furnace so that only the tin melts, leaving any other metals as solids. The melted tin runs down an inclined surface and is collected in a poling kettle, while the other materials remain behind. This process is called liquidation and it effectively removes much of the iron, arsenic, copper, and antimony that may be present. 8 The molten tin in the poling kettle is agitated with steam, compressed air, or poles of green wood. This process is called boiling. The green wood, being moist, produces steam along with the mechanical stirring of the poles. It was from this crude, but effective use of wood poles that the poling kettle got its name. Most of the remaining impurities rise to the surface to form a scum, which is removed. The refined tin is now about 99.8% pure. 9 For applications requiring an even higher purity, the tin may be processed further in an electrolytic refining plant. The tin is poured into molds to form large electrical anodes, which act as the positive terminals for the electrorefining process. 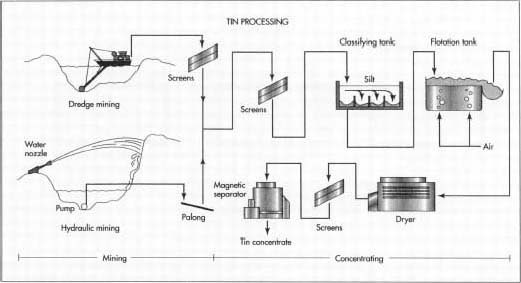 Each anode is placed in an individual tank, and a sheet of tin is placed at the opposite end of the tank to act as the cathode, or negative terminal. The tanks are filled with an electrically conducting solution. When an electrical current is passed through each tank, the tin is stripped off the anode and is deposited on the cathode. The remaining impurities, which are generally bismuth and lead, fall out of the solution and form a slime at the bottom of the tank. 10 The cathodes are remelted, and the refined tin is cast in iron molds to form ingots or bars, which are then shipped to the various end users. Lower purity tin is usually cast into ingots weighing 25-100 lb (11-45 kg). Higher purity tin is cast into smaller bars weighing about 2 lb (1 kg). The processes described have been proven to consistently produce tin at 99% purity and higher. To ensure this purity, samples are analyzed at various steps to determine whether any adjustments to the processes are required. The tin hardhead is further refined, until it is molded into tin ingots. In the United States, the purity levels for commercial grades of tin are defined by the American Society for Testing Materials (ASTM) Standard Classification B339. The highest grade is AAA, which contains 99.98% tin and is used for research. Grade A, which contains 99.80% tin, is used to form tinplate for food containers. Grades B, C, D, and E are lesser grades ranging down to 99% purity. They are used to make general-purpose tin alloys such as bronze and solder. There are no useful byproducts produced from tin processing. Waste products include the soil, sand, and stones that are rejected during the mining and concentrating operations. These constitute a huge amount of material, but their environmental impact depends on the local disposal practices and the concentrations of other minerals that may be present. The slag produced during the smelting and refining operations is also a waste product. It may contain quantities of arsenic, lead, and other materials that are potentially harmful. Tin itself has no known harmful effects on humans or the environment. The use of tin is expected to grow as new applications are developed. Because tin has no known detrimental effects, it is expected to replace other more environmentally harmful metals such as lead, mercury, and cadmium. One new application is the formulation of tin-silver solders to replace tinlead solders in the electronics industry. Another application is the use of tin shot to replace lead shot in shotgun shells. Development work is underway to create a tin-based compound for use in refuse disposal landfill sites. This compound will interact with heavy metals, such as lead and cadmium, to prevent rain water from carrying them into the surrounding soil and water table. Heiserman, David L. Exploring Chemical Elements and Their Compounds. TAB Books, 1992. Kroschwitz, Jacqueline 1. and Mary Howe-Grant, ed. Encyclopedia of Chemical Technology, 4th edition. John Wiley and Sons, Inc., 1993. Stwertka, Albert. A Guide to the Elements. Oxford University Press, 1996. "Bronze Age Mine Found in Turkey," Science News (January 15, 1994): 46.
International Tin Research Institute. http://www.itri.co.udk .